SIUE construction students have a long history of involvement with extracurricular activities and regularly participate in competitions that take place throughout the United States. The competitions are rigorous and require students to use all of their education and training. The department encourages all of its students to get involved with extracurricular activities as these provide many opportunities for networking with construction professionals. For more engineering student organizations visit the School of Engineering. The Constructors Club is an Associated General Contractors (AGC) student chapter. Club activities include guest speakers, site visits, and service projects. Service projects include construction of various public facilities and trips to Florida over spring break to assist in hurricane recovery efforts. The club was awarded the SIUE Kimmel Outstanding Community Service Project Award for 2017, 2016, 2015, 2014, 2010 and 2009. The club also earned third place in the 2016 AGC Outstanding Student Chapter Contest for their service work. The ACI SIUE Student Chapter of ACI International participates in a variety of competitions at the local and international level. Competitions take place every fall and spring at the ACI Convention. Competitions include concrete egg protection device, FRP composite beam, mortar workability, pervious concrete, and the concrete construction competition. The student chapter also participates in local competitions hosted by the Missouri ACI Chapter. The Department of Construction has participated in the ASC Great Lakes Regional Competition for several years. Each year, the ASC Great Lakes Region organizes regional and national open competitions in categories such as commercial, heavy civil and design build. Student teams consisting of six members per team from participating schools compete in these categories. SIUE student teams participate in an after-hours program of training and practice in preparation for the competition. The two-day competitions are designed to expose the students to the real-world experience of preparing proposals on a tight schedule. The competitions are aimed at testing students’ scheduling, estimating, project management, proposal preparation, and presentation skills. During the first day of the competition, students are given a project and the entire day to estimate cost of selected line items, develop a schedule, and put together a bid proposal. Each student team is also responsible for identifying client concerns and developing a logistics schedule. Teams receive information regarding subcontractor pricing and addenda regarding changes to the work, and must complete and submit various contract documents. At the end of the day, they submit their proposals to a panel of outside judges for their review. In the second day, each team is required to develop a 20-minute presentation based on their work and present to the panel of judges. SIUE students regularly place in the top three in regional and national competitions and more importantly gain valuable feedback from industry judges. The New Builders Competition, hosted annually by the University of Cincinnati Construction Competition Club, is a regional construction management competition for underclassmen, coached by upperclassmen. 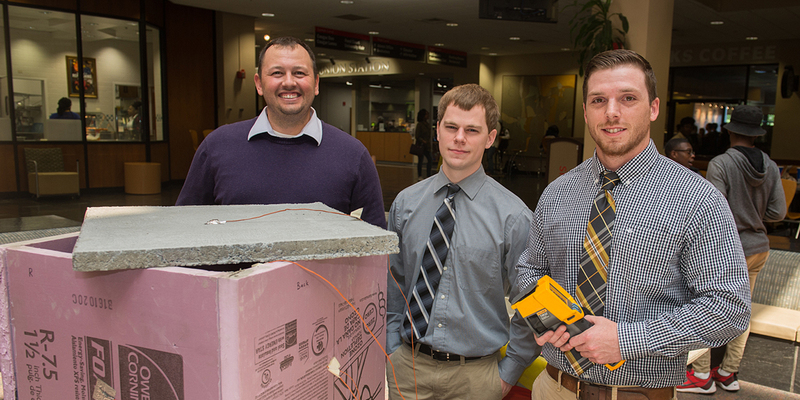 Each year the department sends a team of new construction management majors to compete in this competition. The SIUE Land Surveyors Club is dedicated to those students choosing to get the land surveying specialization. The organization helps facilitate networking with professionals, assists in finding jobs, and helps find scholarships for students. Contact the faculty advisor, David Sherrill, for more information.